Summer is here and the temps are soaring way too fast. This is no time to run the hot oven or slave at the stove. 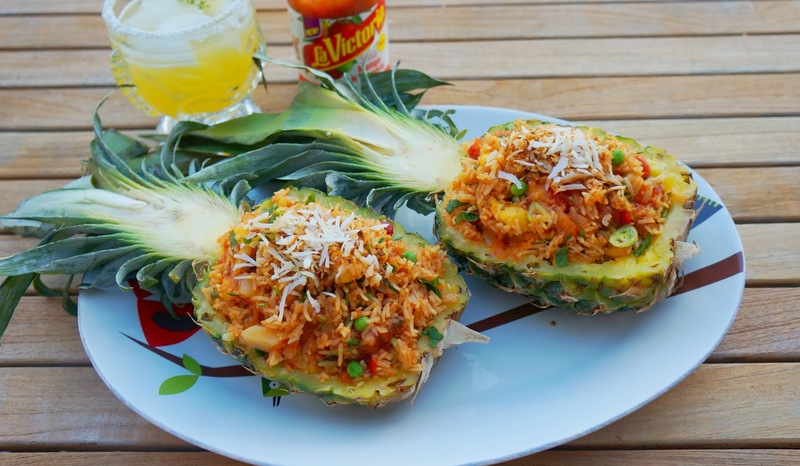 Daydreaming about a tropical vacation got me thinking up a quick Pineapple Fried Rice with a sweet and spicy kick from LaVictoria’s brand new Mango Habanero Salsa. All the trademark flavors are there: Mango, pineapple, peppers and a sprinkle of toasted coconut. A sweet and spicy taste from the islands, La Victoria doesn’t disappoint. Stock-pile this stuff before it disappears. The lazy days of summer are here. With the mercury rising, there is little energy or motivation to do anything. So, don’t strain. Relax. Thanks to the good folks at La Victoria, you’ll have dinner ready in a snap with their sweet & spicy Mango Habanero Salsa. You’re going to have a lot of extra time on your hands. What you do with the rest of your evening is entirely your business. A long nap on the couch with your furry best friends comes highly recommended. It’s what we do on hot afternoons at the homestead. The air conditioning vent is strategically located right about the big brown leather couch in our den, making it prime real estate. Known as the Princess of Fruits, the stately pineapple has symbolized hospitality since the colonial days. Sea-faring folks returned home from the Caribbean bearing exotic spices, rum and tropical fruit. Legend has it that the captain propped a pineapple onto a post near the entrance to his house, announcing his safe return and inviting friends to visit for an evening of story-telling and toasts. Lucky for us, fresh pineapples are everywhere these days and, while the canned stuff is good, there’s nothing like the whole, fresh fruit. You don’t even need to do the dishes., because the pineapple shells make the perfect bowls for holding the rice. Grab one on your way home tonight and don’t forget the salsa. La Victoria is your shortcut to dinner tonight. Pineapple Fried Rice is a favorite at Thai restaurants. This recipe has Mexican flare and packs a mean protein punch from a can of beans. The only thing that needs any time on the stove is the rice. Everything else gets thrown on top of the rice which just soaks up all the yummy flavors. Make meatless Monday a fiesta with this Latin take on a classic Thai recipe and, since BBQ season is here, get outside and grill something. This pineapple fried rice makes a beautiful side dish. Enter to win a $500 BBQ grill at La Victoria now! Who doesn’t want a brand new grill this summer, right? « Crab-Stuffed Portobello Mushrooms & $25 Gift Winner Announced! Pineapples are fun, aren’t they? Such a cute form and they always signal summer. Hope you enjoy this fried rice. Dear Colette, what a beautiful, pretty and summery presentation for your Pineapple-fried-rice! Just gorgeous!